Jussie Smollett is calling the brothers LIARS, denies he planned the hoax attack! 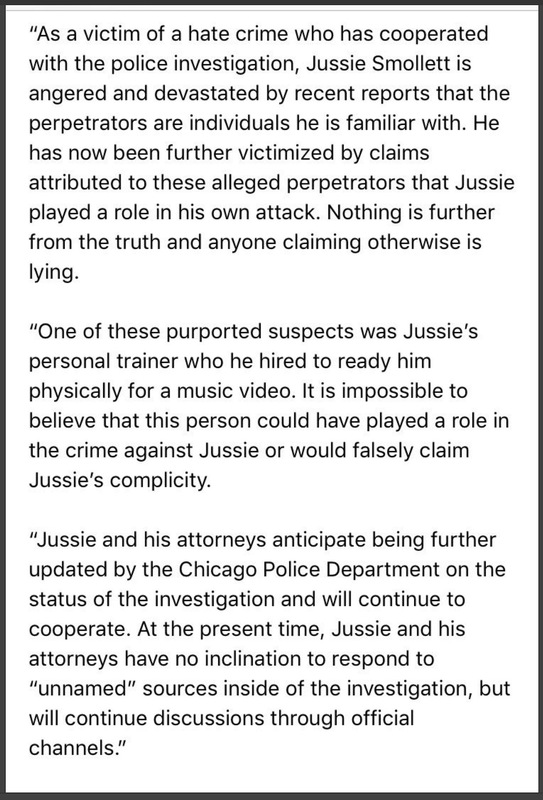 Late last night a lawyer representing Jussie Smollett released a statement about the hoax attack, and he said that he IS STICKING TO HIS STORY, and denies whatever the brothers are telling the cops!! So we’re supposed to believe that his personal trainer just came up with this crazy idea to beat the hell out of Jussie Smollett for what reason? Because he hated Trumpers? That’s it? OR is it more likely that this guy, who appeared on MSNBC preaching liberalism, could have created the hoax himself? But I’m absolutely ecstatic that he is denying it so that we can drag this story on foreverrrr! Class 4 felony! Smollett should consider three years in prison a holiday, a place where he won’t even need his Gindr app. The Fake Actor is LOW IQ. Just another story of black on black crime in Chicago? Boring! This was a Democrat hate crime towards white people and those who voted for Donald Trump. The actor was motivated by his hate not by love. That’s funny; I don’t care who you are! He was dumb enough to believe that he would get away with it. Dude, your massive ego is not supported by your low intelligence. Will the 3 Stooges thread be gone Monday morning? Lying and denying that you lied isn’t a winning strategy, but you go ahead and keep digging that hole. Me thinks he doth protest too much. Liar. Smollett tried to hide his phone records from police. The phone records show, according to some reports, that he called or texted these guys prior to the “attack”. No way this is a surprise. If me and my buddy are going to beat the crap out of somebody, we would add insult to injury and steal their sandwich. Or at least stomp on it or throw it in the gutter. These MAGA bullies were awfully nice to let Jussie keep his tuna melt. Nancy and Dianne taught him well. If he’s guilty, we’ll see how well he learned how to lie and distract. You are the liar! More so, people like you fan the flames of hate! I hope no one will hire you! Maybe you can work at McDonald’s or dig a ditch? The pretenders, like Robert D. Zero will probably defend him at the Academy Awards. Democrats & liberals are all about being intolerant hateful bigots who spread lies. This is what they do. His next hoax will be an “attempted suicide” to try and garner sympathy. 18 U.S. Code § 2331. The New York Post is reporting they also found the magazines with the words and letters cut out that were used in the threatening letters supposedly sent to him a week before the actual hoax. They’ve eaten too many feces. Jussie tried yo cause a race war. Just keep digging moron. You might want to keep your pie hole shut and let your attorneys do the talking. So now he’s going into bold face liar mode 2.0. Got it. Can’t wait to see him wearing an orange jumpsuit. Jessie is going to jail for a long time. Didn’t he claim they were white, and MAGA guys? What a lying piece of scum! He deserves three years behind bars! As a Trump supporter I have never worn a MAGA hat. I wouldn’t especially in Chicago at 2 am. But I did hear it was cold that night so maybe the hat would help. The story itself is so sterotypical of what these waco leftitst think of what a Trump suppprter is. I mean, Jessie, we don’t give a rats azz about you and would never bother to go out in the cold with bleach and a rope to bother to do anything to your stupid dumb selfish azz. Two white MAGA Trumpers attacked you with bleach and a rope. And you were so upset you managed to keep that rope around your lieing azz neck until the police came. STUPID you have mental delutional issues…. see a theropist when in jail for using a false report to perpatrate a hate crime against white men. They’ll end up claiming they were rehearsing for a new reality show…. Wish we could have another 6 threads on this lyin idiot /s. He might end up upsetting these brothers so much that they really will beat him up. And looking at them, that looks like it would hurt. He identified them as white. This could just be part of the Kamala Harris presidential campaign. If that sounds crazy, then nowadays it’s probably true. I’m only interested in what charges, if any, are filled against Smollett.